The hosts of KTLA's morning show exercised a healthy overabundance of caution on Monday morning when a 4.4-magnitude tremor struck the neighborhood northwest of Beverly Hills. Hit the deck! But no...anchors Chris Schauble and Megan Henderson did the right thing in the event of an earthquake, it just so happens that the right thing was slapstick comedy gold. There were thankfully no reports of major damage or injuries as a result of the quake. 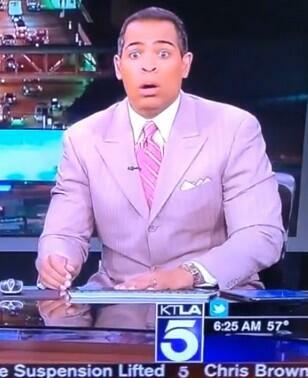 KTLA and Chris Schauble had a good sense of humor about the whole thing.